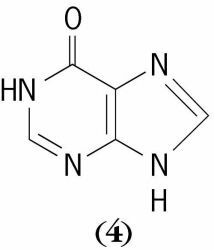 , organic base of the purine family. It was reported (1846) to be in the guano of birds; later (1879–84) it was established as one of the major constituents of nucleic acids. Purines are generally white solids of amphoteric character. They can form salts with both acids and bases. 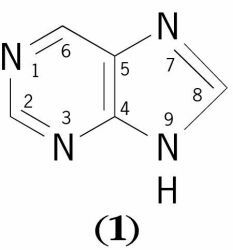 Conjugated double bonds in purines results in aromatic chemical properties, that confers considerable stability, and accounts for their strong ultraviolet absorption spectra. With the exception of the parent compound, most substituted purines have low solubilities in water and organic solvents. adenine, and guanine occur mainly as their 9-glycosides, the sugar being either ribose or 2-deoxyribose. Such compounds are termed nucleosides generically, and inosine (hypoxanthine nucleoside), adenosine, or guanosine specifically. The principal nucleotides contain 5′-phosphate groups, as in guanosine 5′-phosphate (GTP) and adenosine 5′-triphosphate (ATP). Most living organisms are capable of synthesizing purine compounds. The sequence of enzymatic reactions by which the initial purine product, inosine 5′-phosphate, is formed utilizes glycine, carbon dioxide, formic acid, and amino groups derived from glutamine and aspartic acid. Adenosine 5′-phosphate and guanosine 5′-phosphate are formed from inosine 5′-phosphate. Metabolic degradation of purine derivatives may also occur by hydrolysis of nucleotides and nucleosides to the related free bases. Deamination of adenine and guanine produces hypoxanthine and xanthine ( 5 ), both of which may be oxidized to uric acid ( 6 ). A heterocyclic compound containing fused pyrimidine and imidazole rings; adenine and guanine are the purine components of nucleic acids and coenzymes. Urinary excretion of orotic acid, orotidine and other pyrimidines in a patient with purine nucleotide phosphorylase deficiency.